This place, on Mount Zion, is an Armenian Church, convent and cemetery. According to the Armenians, this was the house of Caiaphas, where Jesus was arrested before being trialed. John 18: 24: "Now Annas had sent him bound unto Caiaphas the high priest". 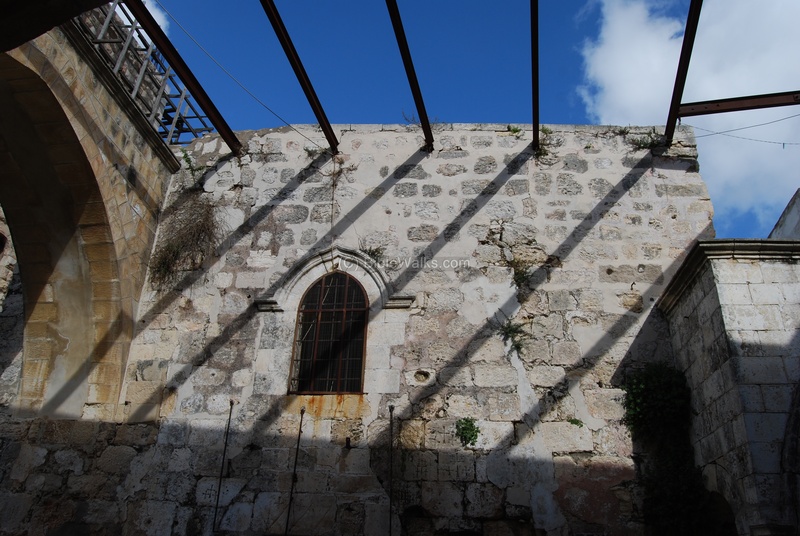 The site is located on Mount Zion, outside of the old city walls and 50M west to Zion gate, along the external wall. At the times of Jesus the area of Mount Zion was part of the new walls of the "upper" city. Although there is no evidence that the site was indeed the house of the high priest, the archaeological excavations held in 1971 in this area did find buildings from that period, including a cellar with fresco paintings. Several hundred years later, during the Byzantine period, the early Christians built several churches around Mount Zion. A mosaic from that period was found in the church. The archaeological excavations also unearthed a section of a paved Byzantine road, which ran parallel to Cardo Maximus. After the Persian or Arab conquest in the 7th C, the structure was destroyed, and the area remained in ruins from the 7th C until the 12th C.
The convent of St. Saviour was established in the 14th C, on the location of the traditional house of Caiaphas. In 1948 and 1967 the structure suffered from severe damages, due to battles in this area. One of the structures is still under restoration. The site is normally closed for the public, except for guided tours. The entrance to the Armenian convent and church is located near the Zion gate, as seen below. 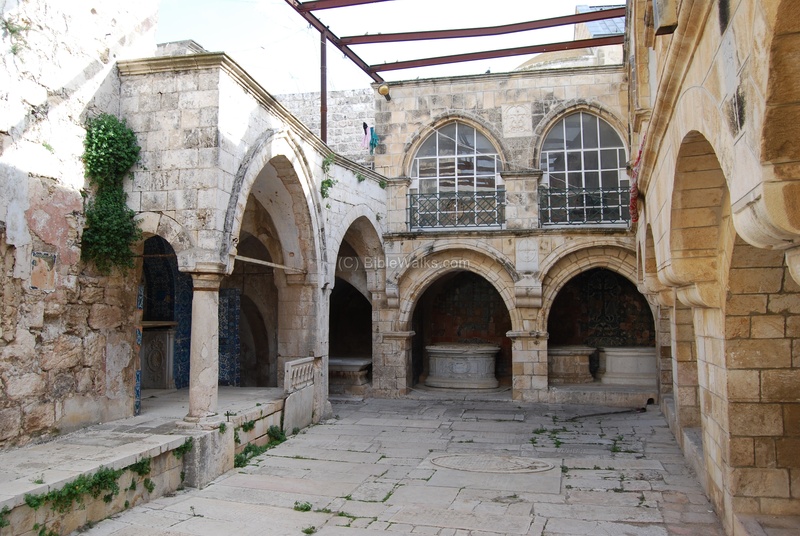 It was established in the 14th C.
The photo below shows the cloister (court yard) of the church of the house of Caiaphas. On the left side is an altar, and on other sides are grand tomb stones of the Armenian Patriarchs. A closer detail of the altar. A section of the northern side of the house is seen in the photo below. Some of the stones have carved crosses, inscribed by visitors. These are the same type of the ancient graffiti of crosses on the walls of the staircase in the Armenian chapel in the holy sepulcher. In the court of the Church are the grand tombs of the Armenian Patriarchs, the leaders of the Armenian church of Jerusalem. Another view from the court side. A detail of one of the tomb stones is seen below. On the floor of the court yard are tombstones of the distinguished members of the church. 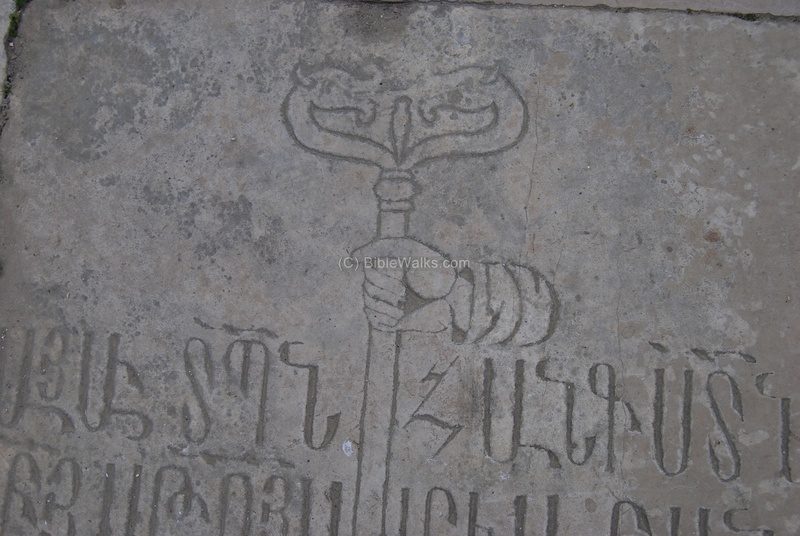 In the photo below, one of the tombs stones with a hand holding a key - these belong to the "key" persons of the church, who held the keys to the church buildings. Another "key" person tomb stone. The court yard is decorated with blue Armenian ceramics. These glazed tiles are an original Jerusalem art, prepared by local Armenian craftsman in 1928. The art of the blue ceramics started in Jerusalem during the British mandate (1920-1948) when some of the churches were restored. This art was based on a 15th C Turkish center in Iznik that produced tiles and ceramics for the Ottoman empire. The glazed ceramics were first was introduced to Jerusalem in the 16th C by when the Dome of the rock tiles were repaired by the Ottomans under Suleiman the Magnificent. The Iznik center, which assembled a number of craftsmen from the Turkish empire, decorated many of the major buildings throughout the countries it controlled. This center declined in the 17th C. It relocated to Kutahya, Turkey, in the 18th C. After WW1 the Armenian refugees, who came to Jerusalem and resettled in the Armenian section, imported the craftsmanship and several workshops were established. The British encouraged the use of the blue tiles in the city, and brought in master potters and artists, David Ohannessian and his disciples Nishan Balian and Megerdish Karakashian, who later opened their own workshops. These magnificent tiles can be seen in several buildings and churches (such as St. Andrews and St. James), and in the Armenian institutes such as this church. After Jesus was arrested, he was led to the house of Annas, the father of law of Caiaphas the high priest. Jesus was questioned there by the high priest, then led to house of Caiaphas. "Then the band and the captain and officers of the Jews took Jesus, and bound him, And led him away to Annas first; for he was father in law to Caiaphas, which was the high priest that same year. Now Caiaphas was he, which gave counsel to the Jews, that it was expedient that one man should die for the people". ... "The high priest then asked Jesus of his disciples, and of his doctrine". ... "Now Annas had sent him bound unto Caiaphas the high priest".